In clinical and pharmaceutical proteomics, serum and plasma are frequently used for detection of early diagnostic biomarkers for therapeutic targets. Although obtaining these body fluid samples is non-invasive and easy, they contain some abundant proteins that mask other protein components present at low concentrations. The challenge in identifying serum biomarkers is to remove the abundant proteins, uncovering and enriching at the same time the low-abundance ones. The depletion strategies, however, could lead to the concomitant removal of some non-targeted proteins that may be of potential interest. In this study, we compared three different methods aimed to deplete high-abundance proteins from human serum, focusing on the identification of non-specifically bound proteins which might be eventually removed. A Cibacron blue-dye-based method for albumin removal, an albumin and IgG immunodepletion method and an immunoaffinity column (Multiple Affinity Removal System) that simultaneously removes a total of six high-abundance proteins, were investigated. The bound proteins were eluted, separated by two-dimensional gel electrophoresis and identified by Nano LC-CHIP-MS system. Flow-through fractions and bound fractions were also analysed with the ProteinChip technology SELDI-TOF-MS. Our results showed that the methods tested removed not only the targeted proteins with high efficiency, but also some non-targeted proteins. 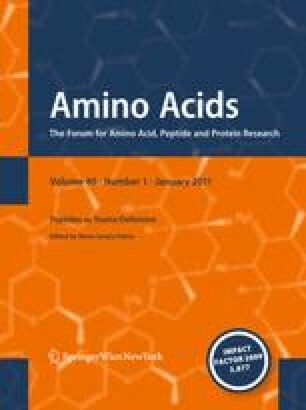 We found that the Multiple Affinity Removal Column improved the intensity of low-abundance proteins, displayed new protein spots and increased resolution. Notably, the column showed the lowest removal of untargeted proteins, proved to be the most promising depletion approach and a reliable method for serum preparation prior to proteomic studies. The online version of this article (doi: 10.1007/s00726-010-0628-x) contains supplementary material, which is available to authorized users. The authors wish to thank Dr. Adriano Benedetti and Dr. Diego Pinetti (C.I.G.S., University of Modena and Reggio Emilia, Italy) for mass spectrometry analysis by Nano LC-CHIP-MS. Special thanks to “Fondazione Cassa di Risparmio di Modena” (Italy) for financial support.